In January 2014, Sharp unveiled 7" WXGA MEMS-based displays, promising to release them within six months. Last week during the SID conference, Sharp unveiled new prototypes, saying that they will start shipping those displays in Q4 2014 (yes, still half a year away). 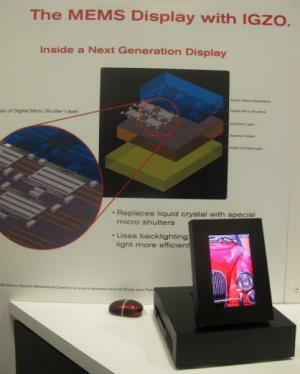 Sharp's display use an IGZO backplane and MEMS technology developed by Pixtronix (a subsidiary of Qualcomm). The 7" 1280x800 panels offer a color depth of 24 bits and a 122% NTSC color gamut. Sharp says that this display is very power efficient - with full color it consumes less than half the power an an LCD panel. A monochrome display will use 1/10 of the power used by an LCD.